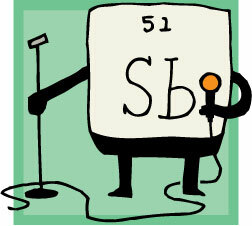 Slate is starting a series of posts on the periodic table of elements, with author Sam Kean writing a separate post about each of about two dozen of the most interesting elements. The first entry is for antimony, which I believe, is the sexiest of the elements. It was widely used in alchemy, but had better results elsewhere. Egyptian women used one form of antimony, stibium, as eyeliner (hence the symbol for antimony, Sb, even though neither letter appears in the element's name). Pills of the element became popular as a medicine in the 1700s, especially as a laxative, able to blast through the most compacted bowels. It was so good the chronically constipated would root through their excrement to retrieve the pill and reuse it later. Some lucky families passed down antimony laxatives from generation to generation. Unfortunately, antimony purges the bowels so well partly because it's poison—the body wants to get rid of it. But these were the days in medicine of fighting fire with fire: Doctors believed the only way to cure a violent illness was with an equally violent reaction to medicine, and antimony's popularity grew. Other elements will be posted through the month of July. Link to introduction. Link to antimony. Cool. Antimony seems rather akin to the colon flushes of today's world. I wonder what people 100 years ago with think of botox parties and other goofy stuff we do. Whew, I was afraid no one would get that! Sexiest of the elements? Taking lines from Zach Anner much?